Can you find it pleasant being in the element of water if you are not a fish? How can we enjoy the sensory qualities of cold and hot water as it forms pearls over our skin and bodies? And does the glistening of the light, which breaks in drops or torrents, not refresh our minds and senses? 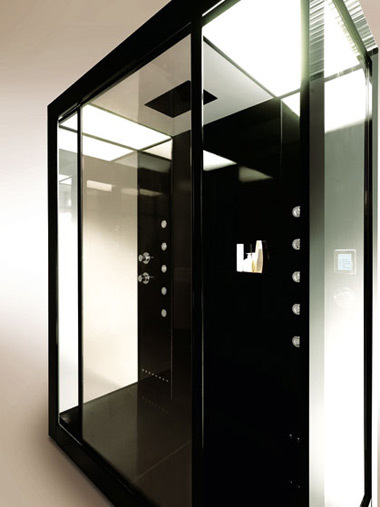 In order to combine all this into one experience, Ludovica and Roberto Palomba have designed a special piece of architecture, namely a bright and clear room for an enjoyable water experience. The result was recently presented at the Cersaie 2007 at the Kos-Zucchetti stand: "AVEC MOI", the version to enjoy alone, measures 135 x 90 x 230 centimeters. 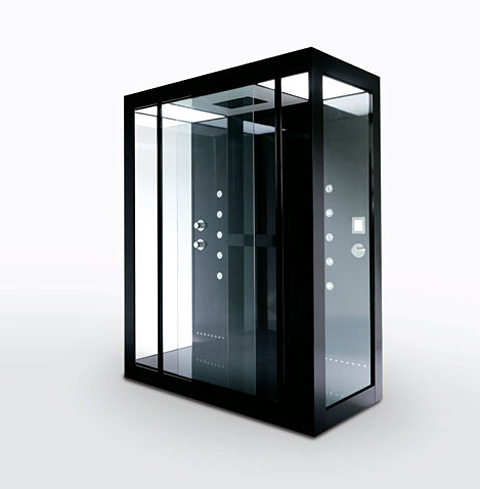 And for those who want to save water and prefer showering in pairs there is the "AVEC TOI", measuring 180 x 90 x 230 centimeters.Neither versions are shower cubicles in the conventional sense, but rather small, fine glass houses. 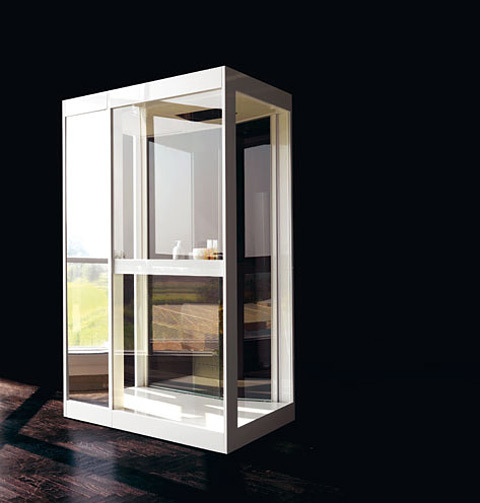 Its aluminum frame holds generous glass panels and is available in white and black finish. There are no conventional taps inside, no ordinary mixer taps, showerheads or hoses, rather, the multiple shower functions are controlled by chrome knobs, whereby the design has been reduced to the elementary, to the pure experience of water. It sprays, patters, trickles and flows from numerous jets, sometimes like soft rain, sometimes as massage jets or in the form of steam. In addition, the idrocolore system floods the room with colored light, full of nuances. And if this is still not enough, "AVEC" can even be fitted with sound (radio) and a touch screen. 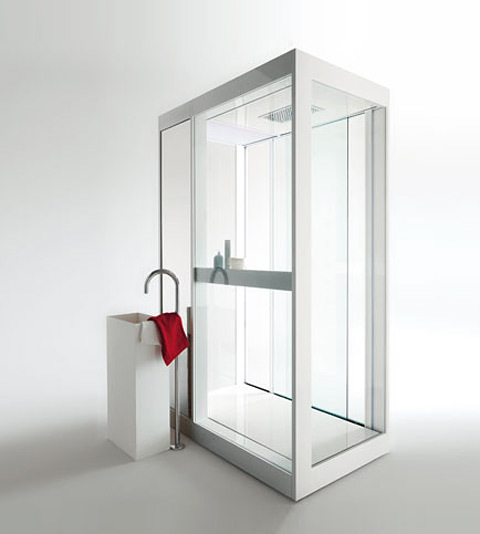 The reduced shape of the cuboid-shaped glass shower does not distract the senses, focusing them instead on the experience of water. In symbolic terms, "AVEC" stands for high design quality and the timeless elegance of Kos bathroom creations - which is no wonder considering the Palomba architect and designer couple also work as art directors for the manufacturer. The pair also conceived the exhibition design for the appearance of Kos and Zucchetti at the Cersaie: A 350 square meter island made completely of water.